Destination Recreation: Local Sugarhouses | Destination Recreation | Kids VT - small people, big ideas! The most practical advice for families visiting sugarhouses this month? Bring boots. Vermont fêtes its famous sugaring season with Maple Open House Weekend — March 23 and 24. To help everything run smoothly, the Vermont Maple Sugar Makers' Association provides a map of sugarhouses that are open for the event. Some of them, like East Montpelier's Bragg Farm Sugarhouse on Route 14, offer easy access along a main highway. Others lie on muddy back roads. Events run the gamut from simple to sophisticated. In Huntington, the Green Mountain Audubon Center will serve warm syrup samples and the traditional sugar-on-snow while billowing clouds of sweet steam rise from the sugarhouse. In Fairfax, Runamok Maple — known for the infused, smoked and barrel-aged syrups that made Oprah Winfrey's 2017 Favorite Things list — will offer free samples of maple's sweet and savory sides in mocktails and dips, along with cheese pairings. Runamok's emphasis, co-owner Laura Sorkin says, is "all about pairing maple syrup with food." 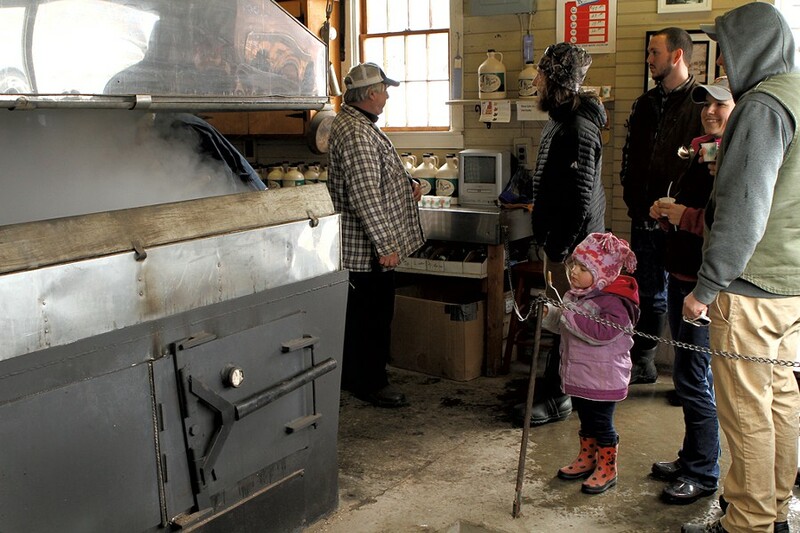 Whatever their approach, all sugarhouses do the same thing: boil maple sap to make syrup. Sugaring season begins when days rise above freezing and nights dip below 32 degrees. This weather causes the sap to move in the trees — known as a sap run. 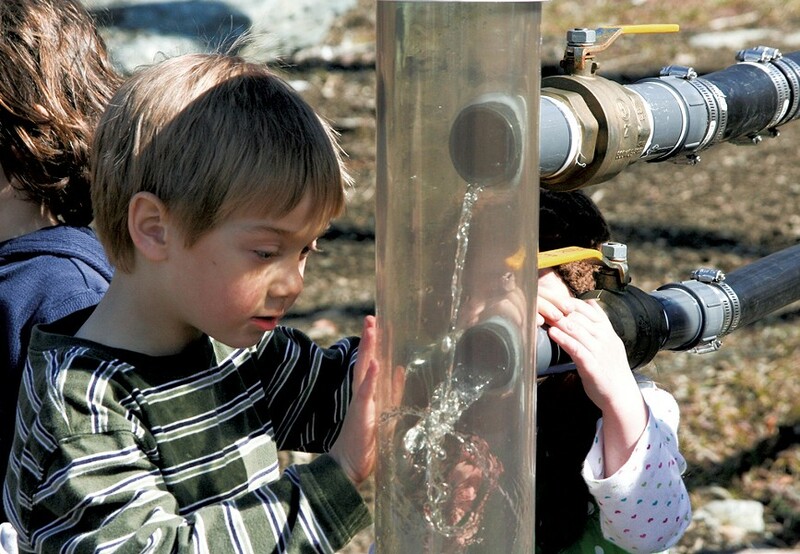 Sap flows out of trees through a tap — a small plastic or metal spout sugar makers drill into trees. This clear liquid is gathered in buckets or flows through plastic lines into a gathering tank. In the sugarhouse, stainless steel pans hold boiling sap. Traditionally, sugar makers burn wood to heat the sap, although many now use oil or gas as fuel. In addition to free tours and samples during Open House Weekend, some sugarhouses will offer the classic complement to all that sugar — a sour pickle. And many will encourage visitors to walk through their woods, which is where those boots might come in handy. 40 to 50 gallons of sap are boiled to create one gallon of maple syrup. A sign that sap is turning into syrup is sheeting. That's when syrup falls as a curtain from a scoop and doesn't drip. Syrup is boiled to the correct density to prevent crystallization. 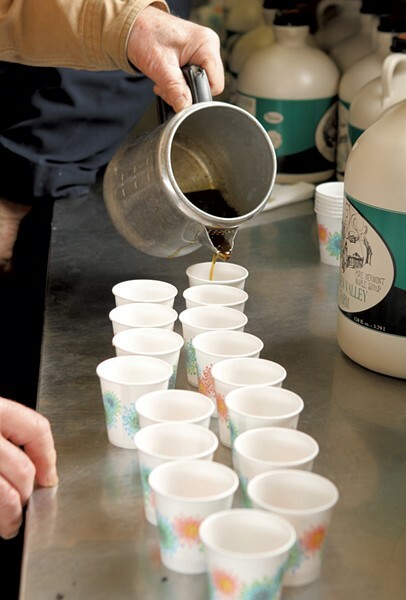 Vermont makes nearly 2 million gallons of maple syrup annually and is the United States' largest producer. Syrup over a buttery stack of pancakes is dandy, but the liquid gold is also delicious in homemade milkshakes and whipped cream, in cornbread and muffins. Entrepreneurs use maple in soda, hard liquor and salad dressings. Vermont has four syrup grades — golden, amber, dark and very dark. Darker syrup is generally made later in the season and has a more robust flavor. Visit the Vermont Maple Festival in St. Albans, April 26-28. In addition to all things maple, this 53rd annual shindig includes a grand parade, a Sap Run, a kids' treasure hunt and good food galore.